It’s been a while since I’ve written a blog post, mostly due to my spending my time more focused on the house work and the fact that I am actively working on my degree. With a baby on the way, the master bedroom and adjoining nursery-nook are of the highest priority! Most every floor in our house needs refinishing. 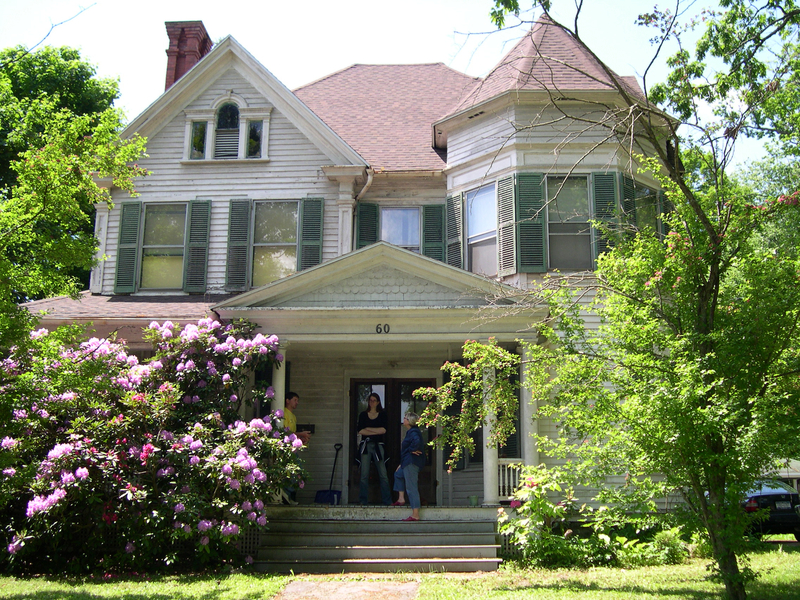 All of the first floor has worn finish and some slight damage due to years of neglect. The second floor has a mix of things going on. THe hall is very worn, the bathroom we have already refinished and the bedrooms are all at different degrees of “bad”. Worse of all the rooms in the entire house is the master bedroom. With heavy paint on the perimeter 20 -24 inches of the room and the entire niche painted with what is at least three coats of porch enamel there’s major sanding and work to be done on this room’s floor! 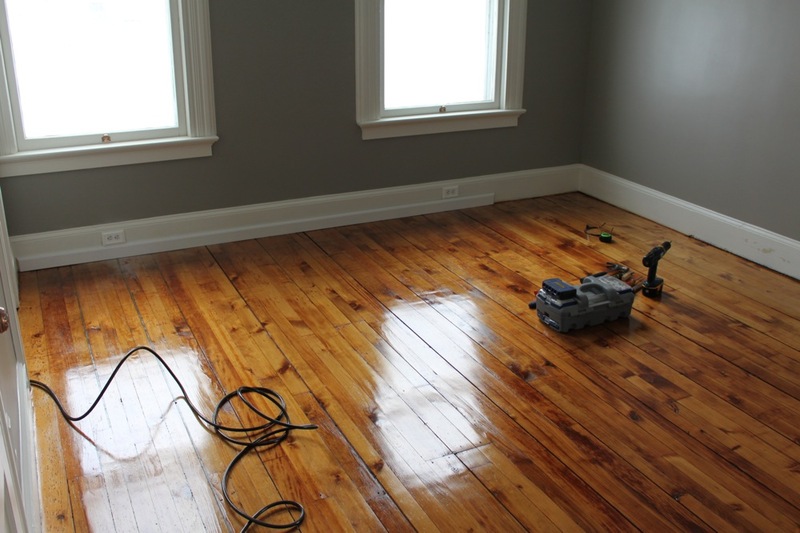 Refinishing floors is something any energetic DIYer can do. It involves renting some equipment and being fairly organized but more so, it requires muscle and energy. 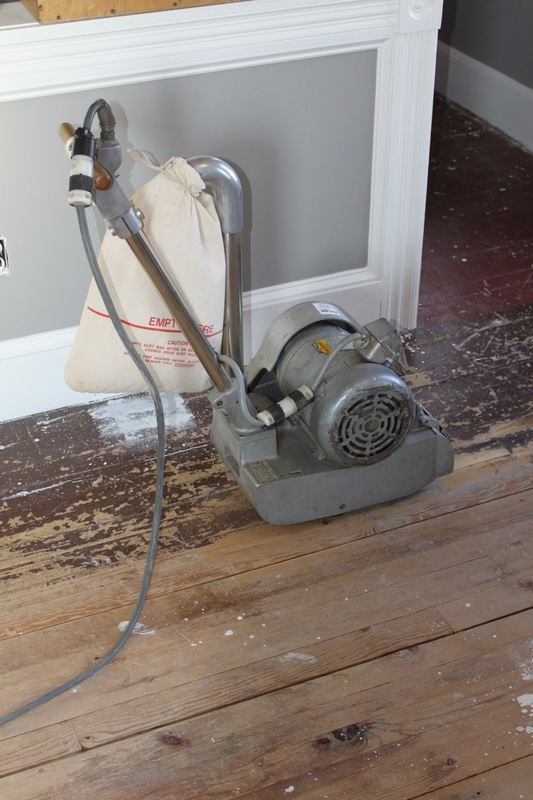 Sanding a wood floor is hard, dusty work. The sanders are heavy, operating the sander requires upper body strength and you’ll feel like quitting well before the job is done. Here’s a picture of a typical drum sander rented from the local hardware / rental center. We’re lucky enough to have a rental center 15 minutes from our house in the next village south of where we live. Their prices are reasonable and better yet, they are very encouraging and nice people. Without going into too much detail about the sander, know this: The whole unit weighs about 180-200 pounds so get help if you need to carry it up stairs! The sander is essentially a large electric motor that spins a single drum that the sandpaper is attached to. This drum spins at a very fast rate of speed tearing whatever it comes in contact with into dust! And speaking of dust, 90% is captured by the suction the machine generates and deposits into the attached dust bag. The master bedroom being roughly 400 square feet of floorspace generated just under a full 30 gallon garbage can of dust when all said and done. Good thing the sander has dust collection. Could you imagine having to sweep all that dust! As you can also see in the picture, we had paint to remove from the master bedroom floor. It appeared to be a porch and deck enamel type paint that was still very well adhered to the floor. Luckily it was only painted around the perimeter of the room … what appears to have been a painted border around a centered throw-rug which was stapled to the wood. To efficiently remove the paint required that I start with 26 grit paper. For those of you that have not seen 26 grit before it’s similar in texture as asphalt roofing shingles. Needless to say, this floor has some irreversible damage not even this heavy-duty sander can remedy but the floor will be massively improved no doubt! The sander has an on and off trigger. It’s as easy as that. You plug it in and pull the trigger and hang on! The sander wants to move forward due to the rotation of the spinning drum as it gets traction on the floor. The only “rule” is do not allow the drum to be in contact with the floor while standing still. If you keep the sander moving forward or backwards, the finish will be good. If you stop, even pause, the drum will create a “swail” in the floor. The painted floor was in such poor condition it required 5 full passes starting with 26 grit and ending with 100 (26, 32, 60, 80, 100). With so many passes on heart pine flooring, I surely got a few “swails” in there. Although not pictured, I rented a “pad sander” that allowed me to remove many of the defects of the more harsh sanding process the drum sander left behind. Also not pictured is the edge sander. As you can barely see in the picture, the drum and pad sander cannot quite get closer enough to the baseboards so an edge sander is required. 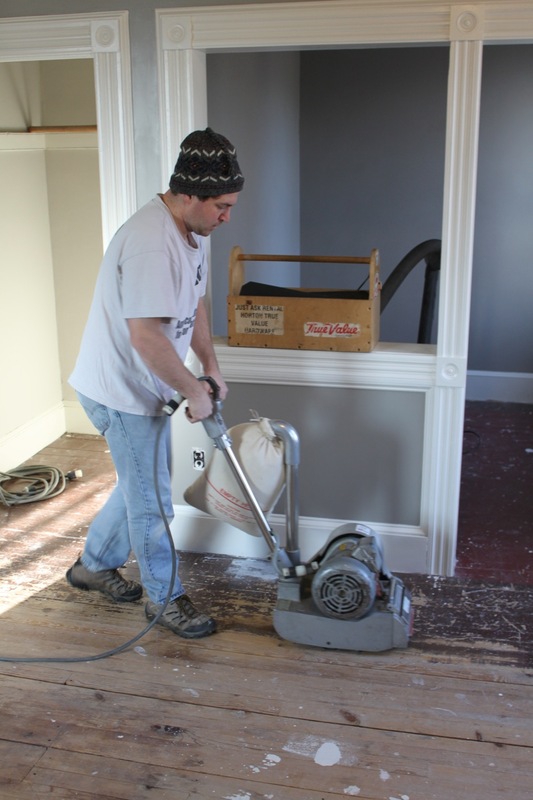 The edge sander is a heavy-Floor sanded before edging completed duty disc sander that allows you to safely sand right up to the baseboards. I removed and discarded all of the shoe molding since what was used was quarter-round. I’ll digress here but it really bugs me when carpenters use quarter-round instead of real shoe molding. Quarter-round lacks the slight vertical gain you get from shoe molding which makes the profile a little more elegant but more so, makes sweeping the floor, up to the edges, more easily done! After all the sanding was complete and I vacuumed and tack-mopped the floor to rid it of all dust the finishing could begin! We chose to stay true to the period of the house and used an oil finish. To be specific, I researched oil finishes for 1880’s era homes. Most commonly used were tung oil finishes; sometimes simply tung oil alone. Waterlox still makes their “Original” formula just as they did in 1910, only 25 years later than our home was built. As far as commercially available floor coatings go, this was as close as we were going to get to “original”. The oil accepts up to 25% oil based stain added directly to it or the floor can be stained first. Since we only wanted to add subtle tone to the already well aged heart pine floor, we added 25% Minwax Early American stain directly to the first coat of oil. I pad-applied the first coat and vented the room. One nice feature about tung oil is that it dries and cures by oxidation meaning all you have to do is supply fresh air to the room. An open window with a window fan does the trick… even in the middle of the winter with temperatures in the 20’s. The entire finish takes 4 coats to complete. The first coat with stain mixture (which soaks in dramatically) and then three subsequent coats of the oil alone to build up a durable, semi-gloss finish. Allowing at least 24 hours between coats to dry, an entire floor takes just under a week to complete however with the busy schedule of everyday life and trying to optimize the warmest days to vent and circulate air had us done in about 2 weeks. I’m sure we’ll write one last blog post on the mast bedroom to show the room in it’s finished state but here I’ll share one last picture that gives a decent visual for the finished floor. There are a few tools on the floor due to my putting in some extra base molding. The living and dining rooms have double stacked bas moldings so we took that design element upstairs into the master bedroom as well. This allowed me to make a new, clean line of base molding which framed the newly refinished floor nicely. Every project thus far has taught us new lessons. The major lesson I’m taking away from refinishing the master bedroom floor is to never use a lamb’s wool applicator pad again. I brushed the last coat by hand due to the fuzz left from the “lint free, fuzzless” pads we bought. I washed them before use as directed and “delinted” them too. Oil floor finishes do not require any sanding of the oil but due to the pad leaving fuzz on the third coat, I had to sand the third coat, mop with mineral spirits and then proceeded to brush apply the final coat. It came out nicely considering where it began! WOW!!!!! The floor is FANTASTIC!!!!!!! The floor looks great, Bill! Holy cow. That’s a LOT of work (I totally appreciate that!)!!! A gift with no return policy! yikes – what work! and what incredible results! Be-autifulllll! Next Next post: The Master Bedroom is Complete!